I decided I would post this - though it seems a very ordinary creation to me - as it might encourage others who are setting out upon something new. It is based upon the first tangle (Crescent Moon) in Suzanne McNeill's Zentangle Basics book. I started out with something else in mind & tried using a stamped image but quickly discovered that I was trying to run before learning to walk - something that I have been reminded of time & again over the last week. In the past an aspiring artist learnt by serving an apprenticeship & copying his Master's work, he didn't just dive in & produce his first painting, but learnt about his materials & went on from there working on a sound foundation (aha! That's why Art Degrees have Foundation Courses). So, why do I expect myself to be able to produce a stamped or complex piece of artwork with tangling just by looking at the directions & jumping in? Some may find that a congenial approach but I find I am discouraged - that is one of those important lessons that I have been re-learning this week. So, I have to start from where I am, serving my own apprenticeship & in that way I will relax & learn systematically how to create the complex tangled masterpieces that I see in the blogosphere. Correction: learn how to create more complex tangled pieces according to my own style! Systematic practice is the key coupled with knowledge of materials - I was reminded that the relationship between different papers & pens will give varying results as I wandered away from using the recommended Sakura Pigma Micron Pen on smooth paper. I had to laugh for as I started to write the above I saw this post, became distracted & began to skim it through but stopped when I came to the story about Maria & Rick testing pens & papers for I wanted to write the above first. I have now avidly read Erin's Zendala Dare 13 through & know from a little experience that what she describes is absolutely true. Great idea to make a tangled twinchie. Your post is very interesting, I like the idea of an apprenticeship. I wonder if anyone does classes in the UK. I would love to go on one. 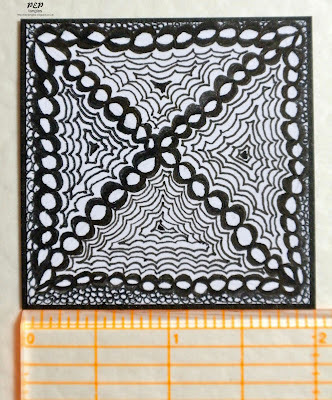 Thanks for the link to the Zentangle Dare #13. Am definitely going to have a go. 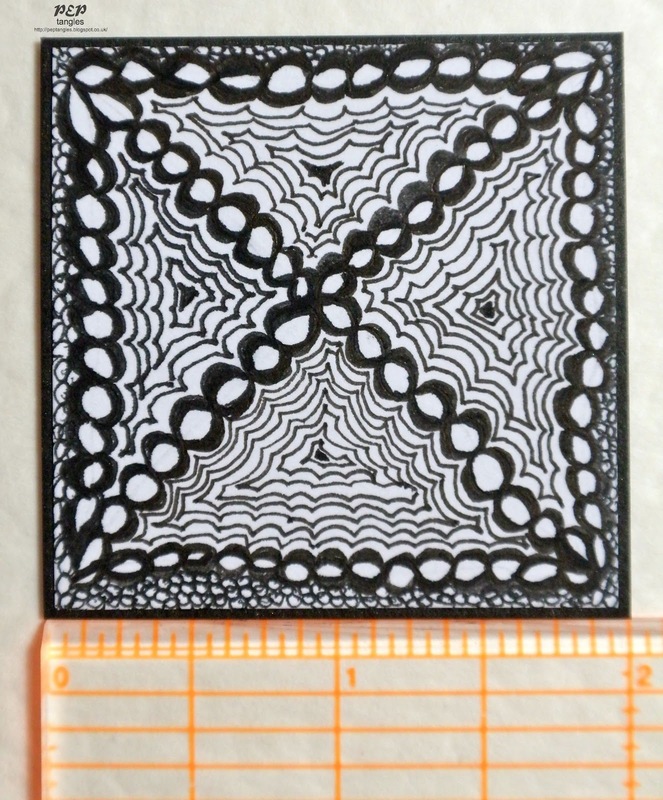 Well done for getting this Zentangle twinchie completed against the odds - hope you are feeling somewhat better by now. Yur post made me smile and I'm off to follow the links too. I do admire your considered approach to things - I'm more of a 'dive in at the deep end and hope for the best' kind of person on the whole!! Whatever the approach I hope we both get there in the end. Ooh this is lovely. The 2nd zentangle Twinchie I've seen. I didn't realise there was so much to it! Keep up the good work. This is a great Twinchie and I must have a go at this Zentagle thing! never done zentangle myself but like your post and twinchie. Well done for getting started on a zentangle challenge project. I still feel nervous about the freestyle approach, but maybe I am starting my apprencticeship too, because today I have been sort of doodling - wonders will never cease!!! Hope you continue to enjoy your experiments. Amazing detail all in just two square inches!